“You ready for the wind storm?” my neighbor asked. He was carrying a bag of groceries. I was fiddling around with my containers, thinking about what I might plant in them this year. I wondered if I wanted anything, not so much to be prepared, but to go along with a wind storm. I decided to go out and grab a Coca-cola. I also decided to take Ruthie with me. By the time we returned, which was less than ten minutes, the wind and rain were powerful. Ruthie was afraid to get out of the car. I felt badly that I had taken her out. Ruthie is terribly sweet and the most sensitive dog in the world. That’s part of what makes her who she is and incredibly lovable. We sat inside the car for a few minutes, listening to the howling wind and sound of heavy rain fall on the car. Things slowed for a moment, but as soon as I opened the door, a gust of rain came down and Ruthie jumped back in the car. Pretty soon the wind stopped and all was quiet. The storm had gone as quickly as it had arrived. 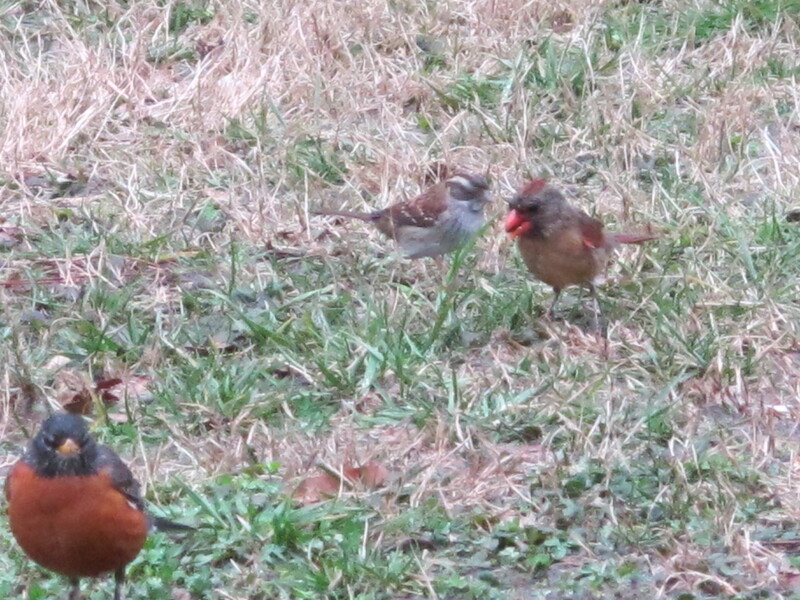 My yard was a series of shallow ponds, that obviously, the Robins love! They surprised me with a vigor and ability to stand still, while rain fell in buckets on their red-breasted bodies. 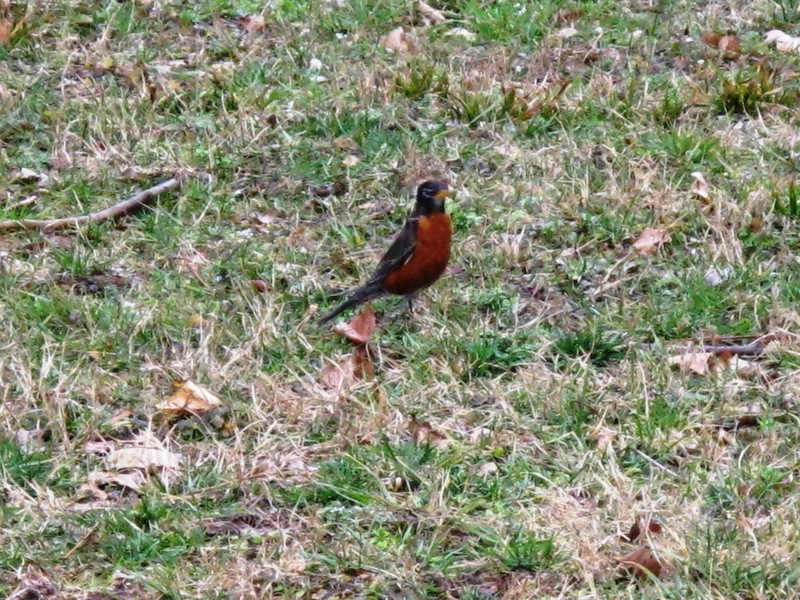 Most of the Robins took cover when the rain fell harder, but one stood its ground through the length of the storm. The persistent and patient Robin kept looking at me and once, when I was taking a photo of a very wet Cardinal, the wet Robin hopped in front of the camera just in time to get in the photograph. Do You See Me? I AM ROBIN! I loved the storm. I also loved that Ruthie and I were home to see the birds that came afterwards! All the birds were here! Most unusual, was a visit from a Bluebird. Normally, the Mockingbird aka “King of the Yard,” simply will not allow bluebirds to cross the little rain-made creek where the lawn meets the trees. I couldn’t get a photo because the Bluebird came to the suet hanging by my front door near where I was standing. I did however have a wonderful macro view! Thank you for visiting Green Healing Notes!